As one of the top sellers of Isagenix nutritional cleansing, weight loss, and performance products in the UK (and Europe), we naturally get asked a lot of questions regarding the company, its products, and the business opportunity. What makes Isagenix so unique? Isagenix was formulated by the ‘Mineral Man’ himself, John Anderson. With more than three decades of experience formulating vitamins based on Eastern schools of thought, he founded Isagenix using many Eastern herbs and ingredients products in the West simply don’t have. Not only does this set Isagenix apart, but it’s the secret to its science-backed magic. Plus, all Isagenix formulas utilise nothing but the very best ingredients. For instance, Isagenix Shakes feature premium-quality undenatured whey protein from hormone and antibiotic-free grass-fed cows in New Zealand. It’s completely unprocessed and all natural. With Isagenix, superior ingredients are combined in winning recipes to create products your body will love! Is the Isagenix programme hard to follow? Isagenix is a convenient meal replacement solution and provides premium nutrition on demand. This makes it ideal for busy, active people in need of a quick meal and well-balanced nutrition in a flash. Between the dozens of Isagenix shake and snack options and the endless Isagenix-friendly meal ideas, looking and feeling great with Isagenix is easy as 1-2-3. What’s the difference between cleanse days and shake days? On cleanse days, you abstain from food and take Cleanse for Life throughout the day to cleanse your body and rid it of toxins. If you get hungry, you can indulge in an IsaDelight or Isagenix Snacks to hold you over until it’s time for a shake. On shake days, you have an Isagenix IsaLean or IsaLean Pro Shake once in the morning and once in the evening while enjoying some snacks and a healthy lunch in between. On both cleanse days and shake days, you should drink three to four litres of water as adequate water intake is a must when following the Isagenix programme. Can I try Isagenix out before I commit to the entire 30-Day System? You certainly can. 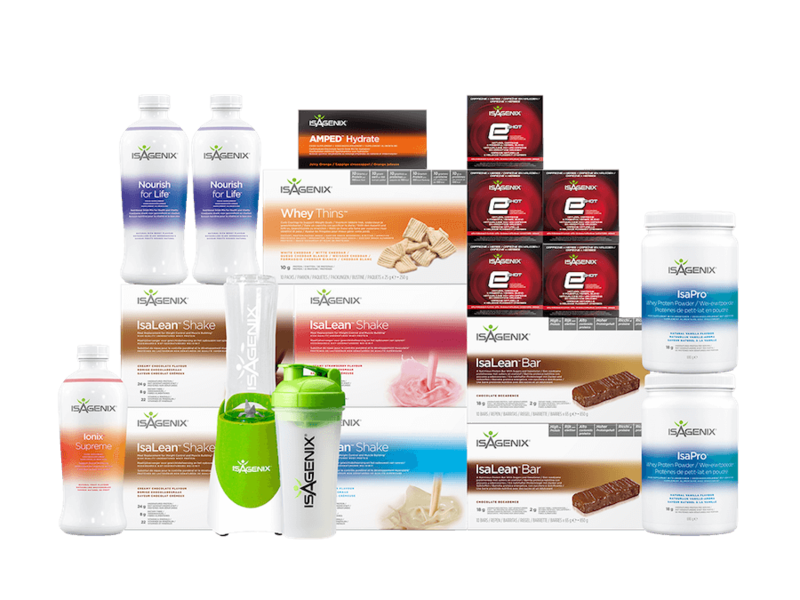 While most Isagenix users go all in with a premium pack or the 30-Day System, Isagenix products are sold separately as well. That being said, since the products complement each other and work synergistically for maximum benefit, you’ll experience the best results by following the full Isagenix nutritional cleansing programme. How long do I need to follow the Isagenix nutritional cleansing programme? Isagenix products deliver wave after wave of nutritional benefits to improve your body and health from the inside out. While some people only follow the Isagenix programme for a month or two and quit after reaching their weight loss or fitness goals, the ones who are most successful are those who continue living the Isagenix lifestyle as long as possible. Why is water intake so important? Isagenix products are extremely effective in helping to rid your body of toxins and impurities. However, you need to drink a lot of water in order to help flush them out of your body. When nutritional cleansing with Isagenix, you should aim to drink at least three litres of water each day. To mix things up, you can substitute herbal or green tea and you can add flavoured stevia as well. Can I earn money selling Isagenix products? Absolutely! In fact, with the Isagenix business opportunity, the sky is truly the limit. When you see the excellent results Isagenix can provide, you’ll want to become an Isagenix Associate and share the products and your story with others. As an Associate, you’ll receive your very own Isagenix website, access to premium business-building resources, and support from successful Associates like us. With millions of people in the world hoping to look and feel better, the earning opportunities are endless. No, you are more than welcome to simply enjoy Isagenix products as a customer and not an Associate. Whether or not you want to make money with Isagenix is entirely up to you. However, if you want to make a full-time income with Isagenix while putting in part-time hours, we’re here to help!